Coping Strategies for Returning Veterans and Their Families. A critical and underserved part of the support network for military members are their parents. Often burdened with the financial, psychological, family and logistic challenges of their son or daughter who served, they experience their own stress related to both deployment and readjustment that may unfortunately be overlooked or minimized. Yet for parents who have maintained a singular focus on the safe return of their beloved child, the aftermath of deployment can be an overwhelming emotional roller coaster ride. 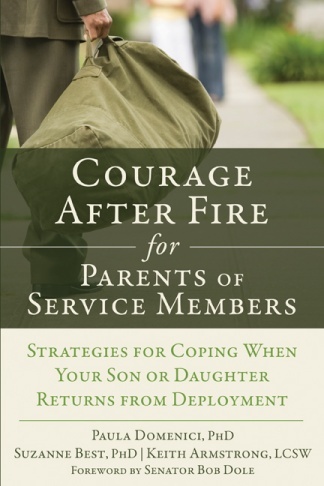 Courage After Fire For Parents of Service Members is a much-needed book offering support and understanding to parents when their son or daughter returns from war. The authors examine the common challenges of readjustment through the lens of parenthood, providing insights, coping tools, resources and practical help to all the mothers and fathers who selflessly raise and support those who defend our country. ForeWord Magazine's 2006 Book of the Year Silver Medal Winner! 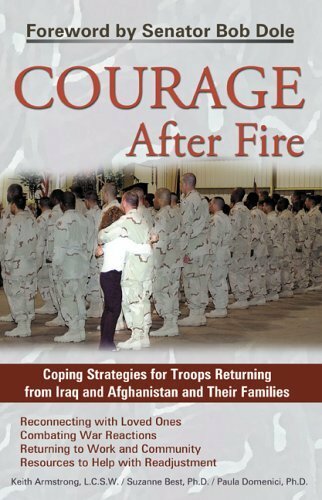 We've written Courage After Fire to acknowledge the many challenges faced by Iraq and Afghanistan War veterans, and to support our troops and military families in their transition home. This self-help guide provides information on combat stress, war related grief, anger, and sleep problems, and Traumatic Brain Injury (TBI), as well as the effects of PTSD on couples and children. In addition, we offer specific strategies and assistance for the post-war adjustment and combat stress treatment of Iraq and Afghanistan War veterans, Active Duty service members, National Guard, and Reservists. This web site has been written strictly for informational purposes, and in no way should it be used as a substitute for consultation with professional therapists. All facts on this web site came from scientific publications, personal interviews, published trade books, self published materials by experts, magazine articles, the personal-practice experiences of the authorities quoted or sources cited. The authors are providing you with information on this web site so that you can have the knowledge and can choose, at your own risk, to act on that knowledge. © Courage After Fire. All rights reserved.